This chapter describes resources available for Android developers, and how to use them. The best place to learn about Android development and to keep informed about the newest Android development tools is to browse the official Android developer documentation. Get Android Studio: Download Android Studio, the official integrated development environment (IDE) for building Android apps. Browse sample code: Browse the sample code library in GitHub to learn how to build different components for your apps. Each sample is a fully functioning Android app. The GitHub page lets you browse the resources and source files, and clone or download the app project. For more sample code, see "Exploring code samples in the Android SDK" in this chapter. Watch stories: Learn about other Android developers, their apps, and their successes with Android and Google Play. The page offers videos and articles with the newest stories about Android development, such as how developers improved their users&apos; experiences, and how to increase user engagement with apps. Download Android Studio: Download Android Studio for the computer operating system you are currently using. 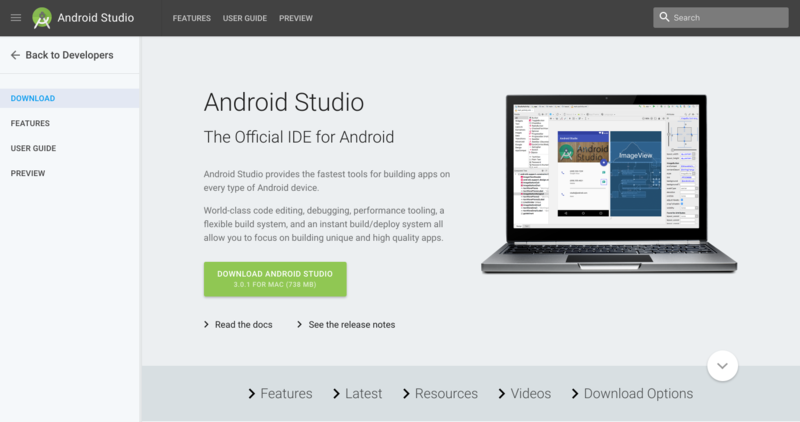 Read the docs: Browse the Android Studio documentation. See the release notes: Read the release notes for the newest version of Android Studio. 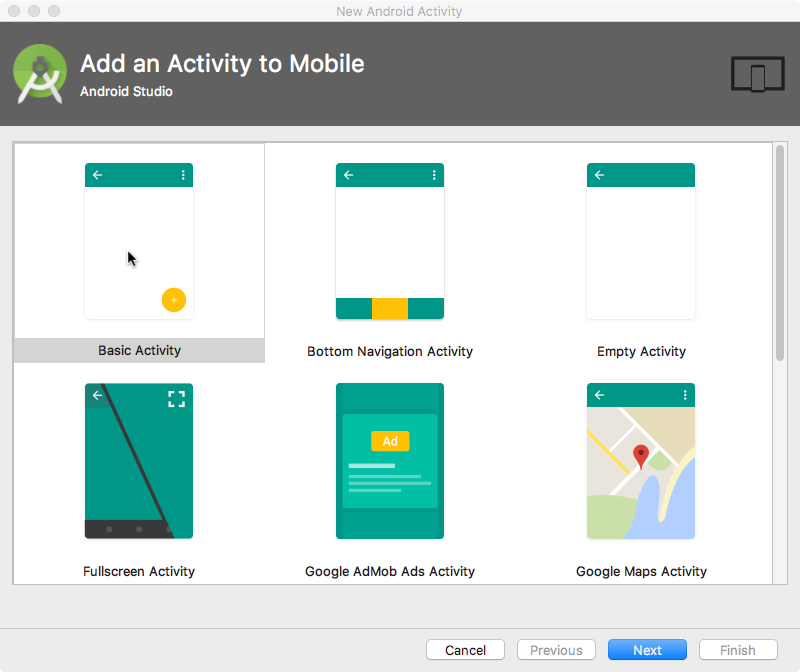 Features: Learn about the features of the newest version of Android Studio. 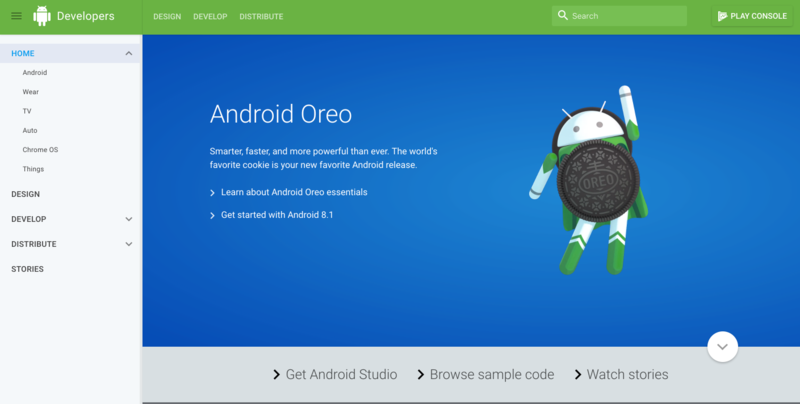 Latest: Read news about Android Studio. 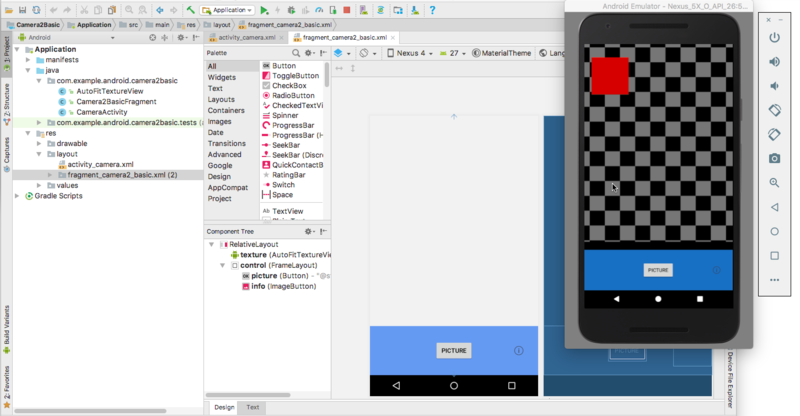 Resources: Read articles about using Android Studio, including a basic introduction. Videos: Watch video tutorials about using Android Studio. 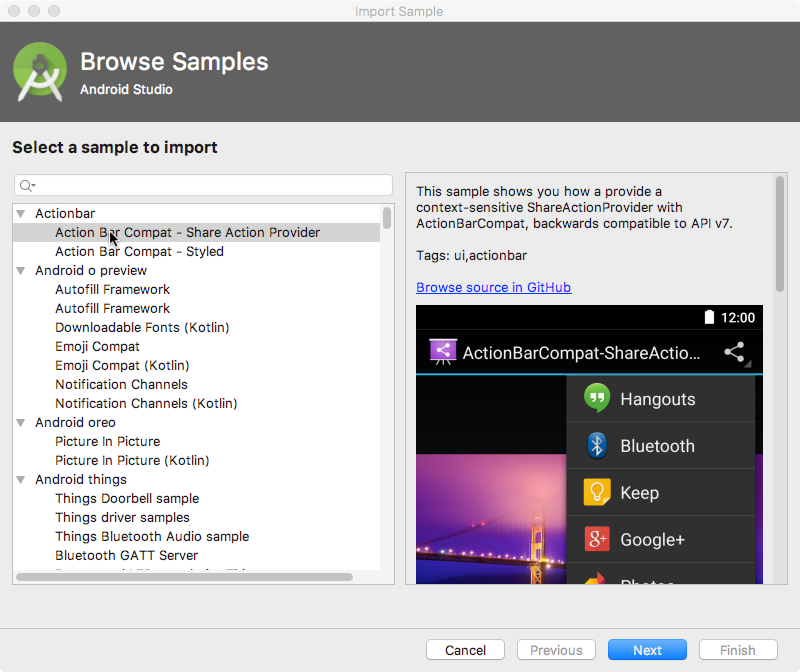 Download Options: Download a version of Android Studio for a different operating system than the one you are using. Introducing material design: An introduction to the material design philosophy. Downloads for designers: Download color palettes for compatibility with the material design specification. Articles: Read articles and news about Android design. The Develop link in the navigation drawer (left column) of the home page provides a wealth of application programming interface (API) information, reference documentation, tutorials, tool guides, and code samples. The Distribute link in the navigation drawer (left column) provides information about everything that happens after you&apos;ve written your app: putting it on Google Play, Google&apos;s digital distribution system for apps developed with the Android SDK. Use the Google Play Console to grow your user base and start earning money. You can accept the Developer Agreement, pay the registration fee, and complete your account details in order to join the Google Play developer program. In the left column, click Android SDK. Click the SDK Tools tab. You can install additional SDK Tools that are not installed by default, as well as an offline version of the Android developer documentation. Click the checkbox for "Documentation for Android SDK" if it is not already installed, and click Apply. Navigate to the sdk directory you copied above, and open the docs directory. Find index.html and open it. In addition to the Android documentation, the Android Developers YouTube channel is a great source of tutorials and tips. You can subscribe to the channel to receive notifications of new videos by email. To subscribe, click the red Subscribe button in the upper right corner as shown below. In addition, Udacity offers online Android development courses. You can explore hundreds of code samples directly in Android Studio. Select Import an Android code sample from the Android Studio welcome screen, or select File > New > Import Sample if you have already opened a project. The Browse Samples window appears as shown below. Select a sample (such as Camera2Basic) and click Next. Accept or edit the Application name and Project location, and click Finish. The app project appears as shown below, and you can run the app in the emulator provided with Android Studio, or on a connected device. Note: The samples are meant to be a starting point for further development. We encourage you to design and build your own ideas into them. Android Studio provides templates for common and recommended activity designs. Using templates saves time, and helps you follow best practices for developing activities. Each template incorporates an skeleton activity and user interface. You select an activity template for the main activity when starting an app project. You can also add an activity template to an existing project. Right-click the java folder in Project > Android pane and select New > Activity > Gallery. The Android Developers Blog provides a wealth of articles on Android development. Google Developer Training: Whether you&apos;re new to programming or an experienced developer, Google offers a range of online courses to teach you Android development, from getting started to optimizing app performance. Click the Android tab at the top of the page. Google I/O Codelabs: Google Developers Codelabs provide a guided hands-on coding experience on a number of topics. Most codelabs will step you through the process of building a small app, or adding a new feature to an existing app. Select Android from the Category drop-down menu on the right side of the page. Android Testing Codelab: This codelab shows you how to get started with testing for Android, including testing integration in Android Studio, unit testing, hermetic testing, functional user interface testing, and the Espresso testing framework. How to assert inside a RecyclerView in Espresso? How do I Add A Fragment to a Custom Navigation Drawer Template? How to populate AlertDialog from Arraylist? "What is the most popular Android OS version in India?" This question collects results about Android market share, including the Dashboards page that provides an overview of device characteristics and platform versions that are active in the Android ecosystem. "Android Settings Activity" collects various articles about the Settings Activity including the Settings topic page, the PreferenceActivity class, and Stack Overflow&apos;s How do you create Preference Activity and Preference Fragment on Android? "Android TextView" collects information about text views including the TextView class, the View class, the Layouts topic page, and code samples from various sources. Preface any search with "Android" to narrow your search to Android-related topics. For example, you can search for any Android class description, such as "Android TextView" or "Android activity". The related practical for this concept chapter is 1.4: Available resources.